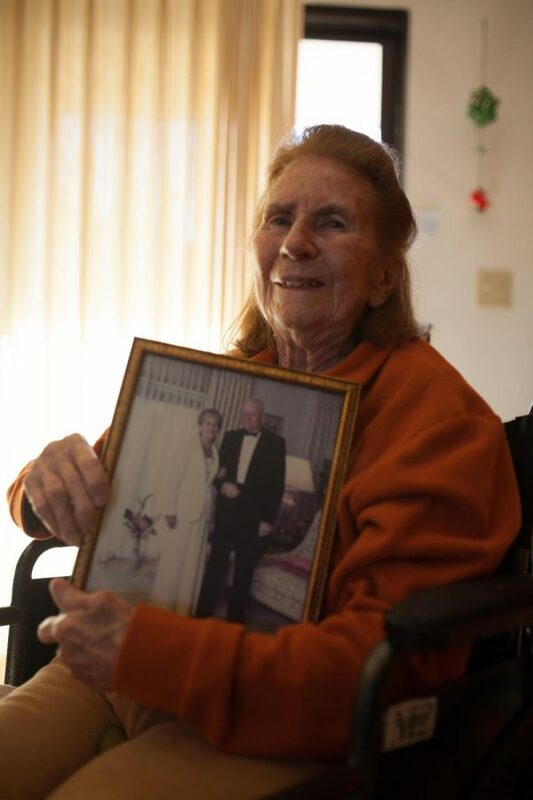 Hunter Elam moves into 95-year-old Helene Denton's Palos Verdes estate from Mechanicsville, Virginia and she and the other occupants of the household teach him a thing or two about striving to live a fulfilling life. Hunter and Helene share a fist-pound. Hunter says it’s his way of knowing that she is doing alright. Photo by Jorge Villa. Eagerly yet reluctantly, a young, blonde-haired man steps through the gate of the Palos Verdes estate. He surveys the house in front of him and eyes the glass door that sits partially open. He doesn’t think twice and walks straight to it. The glass door was the entrance to the estate’s kitchen. His shoes make contact with the hard, cold kitchen floor. He notices a walker propped up next to the counter. Inside the walker sits a small woman whose hair was colored a light brown, yet her skin was decorated with age. She faces the counter with a bowl of steaming oatmeal before her and her arm lifts with a spoonful for a bite. A rush of anticipation runs over Hunter as he abruptly picks up pace and makes his way next to the woman. He extends his hand out to introduce himself. Startled, she looks up at him taking in his 6-foot frame and deep blue eyes. At this point, the warm mushy texture of oatmeal goes down the wrong way and Helene Denton begins to choke. 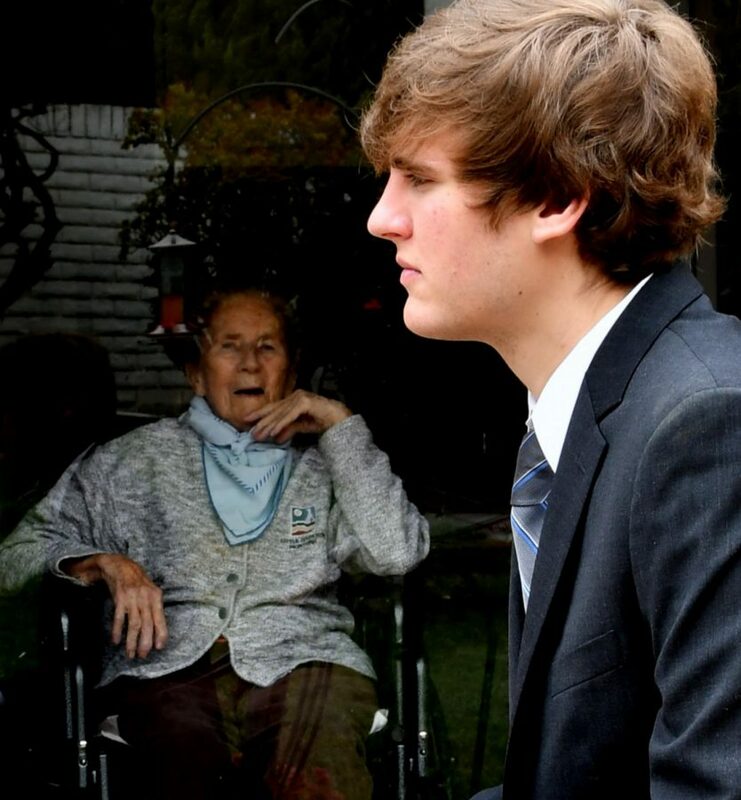 The 18-year-old Virginian, who had left everything he had ever known on the other side of the country to find himself standing standing next to the woman who has opened her home to him, freaks out. “Oh my God, she’s dying,” Hunter thinks as he pats her on the back to bring her relief. It has been three years since Hunter and Helene’s initial meeting, and the two of them have developed an unbreakable bond. Hunter, now 22 and studying political science at El Camino College, is still uncertain about the course of his life. 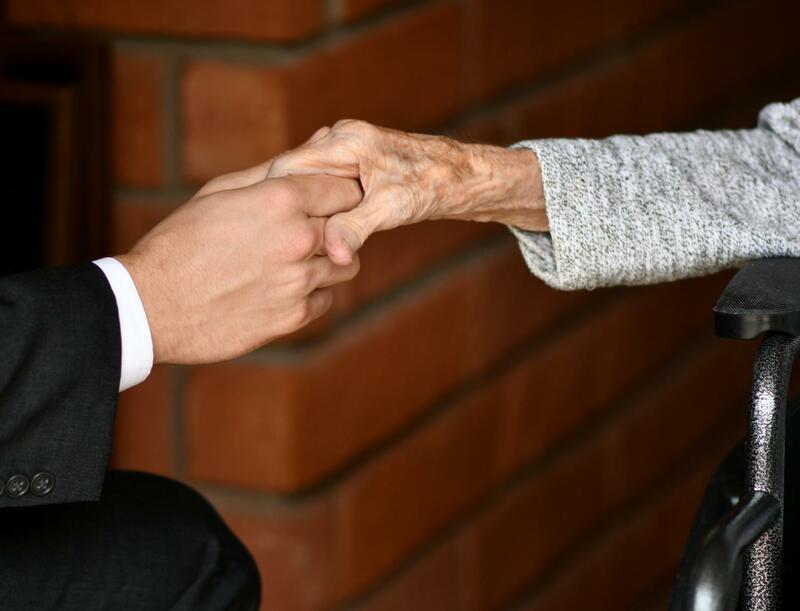 However, he learns from Helene, 95, and the circle of people who lives in her estate that what is more important than the destination is the journey. In addition to studying at El Camino, he is on the debate team and a member of student government. Hunter Elam in Palos Verdes Estates. Photo by Jack Kan. 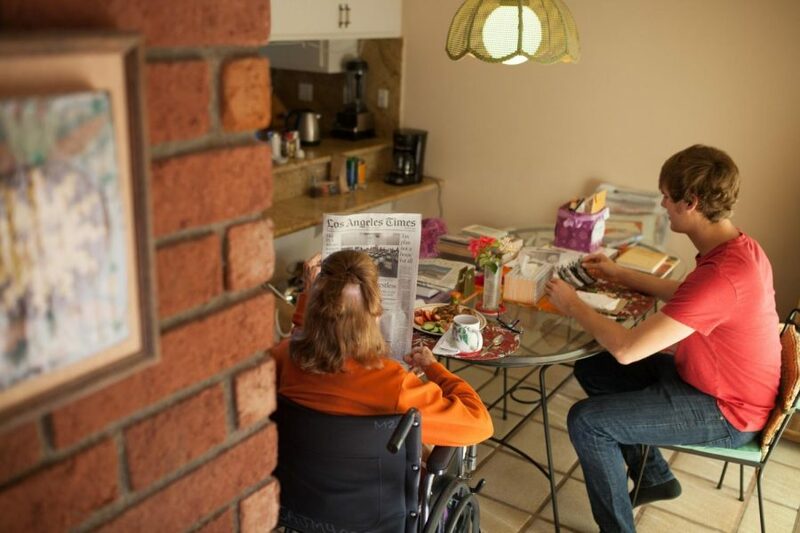 In Helene’s house, Hunter sits to the left side of Helene as she sits at the head of the kitchen table in her wheelchair. Hunter curls his fingers into a tight fist and holds it out to Helene. She obliges by curling her tiny, frail yet dainty fingers mimicking his fists. Mustering all the strength a woman her age could and more, she hits him with her best jab. 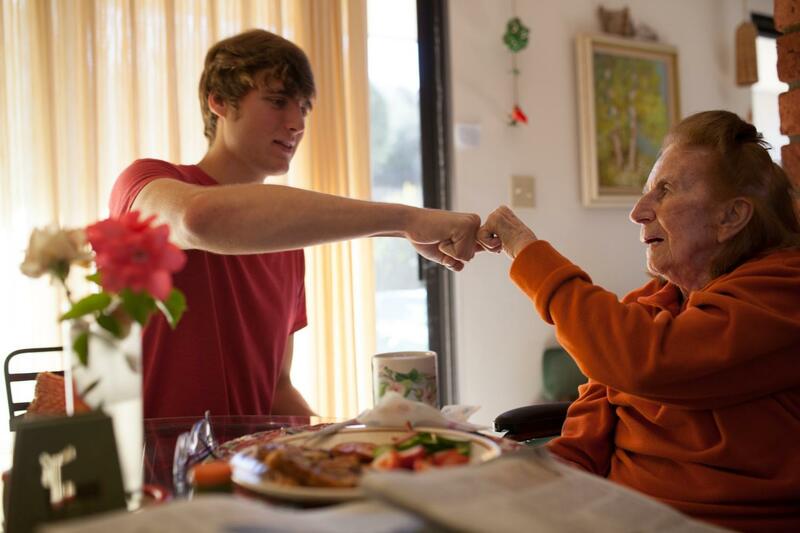 A fist bump — this is how the two greet each other. Hunter says that he and Helene hit it off since they were both talkers. 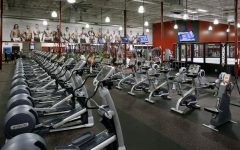 They could spend hours chatting from about anything from sports, particularly football, to the stories of her past, like her marriage to WWII bomber pilot, William J. Denton, who later became an airline pilot. Hunter and Clarita Ong, the main caregiver, sometimes bring out pictures to get her to talk about her life. In the kitchen of Helene’s estate, just enough light cascades across the plain kitchen table, where books and pictures were stacked about. There a scattered visual timeline of Helene showcases the long 95 years of her life. Helene, who is couched in a wheelchair as her hooded eyes run over the timeline in front of her, does not say much. Suddenly a flow of memories and moments escape Helene’s lips. In a low, raspy, yet melodious tone she begins to share her experiences. One photo in particular grabs her attention. She pinches the paper image with her tiny, shaking fingers and brings it up to her face to take a better look at it as her elbows stable themselves on the armrest of her wheelchair. In this black and white time capsule, she is standing with her groom on their wedding day. Her slender body is draped in a satin-like gown that had been sewn by her mother. Alongside the bride and groom were the bridesmaids and groomsmen. 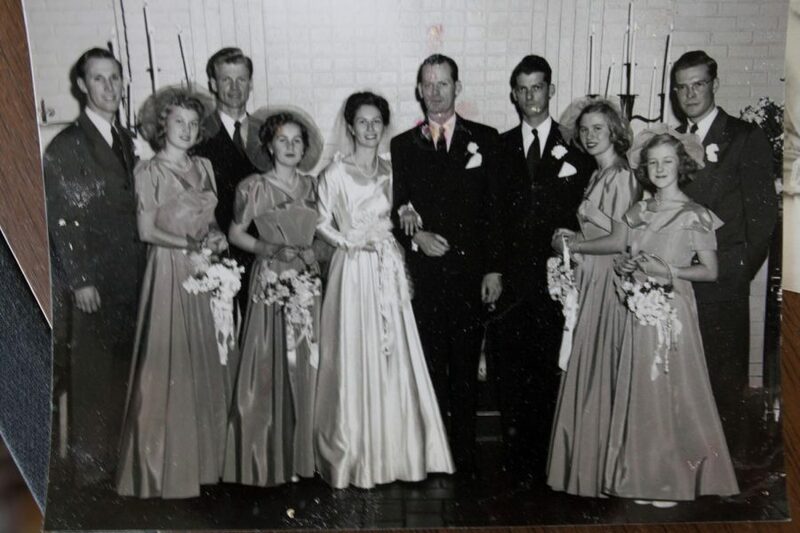 Helene Denton on her wedding day with late husband William J. Denton, U. S. veteran and bomber pilot who served in WWII. They are surrounded by family and friend who were present as their bridesmaids and groomsmen. In the photo, Helene is wearing a satin-like gown sewed by her mother. Photo by Jorge Villa. Hunter, who sits to Helene’s right side, faces her and notices the image. “(Was) his mom a Texan and she wanted him to marry a Texan girl?” Hunter asks. Helene trails off as she attempts to find the right words to finish her thought. “Helene,” Clarita offers. “This gal,” Helene says, referring to herself. Hunter and Clarita laugh affectionately towards Helene. “This gal…it’s like somethin’ out of a movie,” Hunter says. Hunter, too, lives something out of a movie, such as the “picturesque town” of Mechanicsville, Virginia where he had grown up. He left the familiar sounds and souls he grew up with in Mechanicsville to enter into the diverse, congested world of Los Angeles county, inhaling the Pacific Ocean breeze from the balcony of Helene’s Palos Verdes estate. On the bottom living spaces of the estate, before Hunter’s arrival, individuals had already been a part of the Helene’s household. The individuals include a couple who are both U.S. tour guides. The girlfriend, Ria, is from Germany, and she came first in the early ‘90s and used the bottom living spaces of Helene’s estate. Later her boyfriend, Eric, who’s from Guatemala, joined her. In addition, the main caregiver for Helene, Clarita Ong, also brings spirit to the home whenever she’s around. Another occupant, James, who is Helene’s 60-year-old nephew, holds partial responsibility for bringing these people and Hunter into the household. “Quite honestly, I feel like I try to maintain a good quality life for her (Helene) because I was out of the country and I couldn’t (be), and I wasn’t, there for my mom when she needed it,” James says. Helene and James mother were sisters. 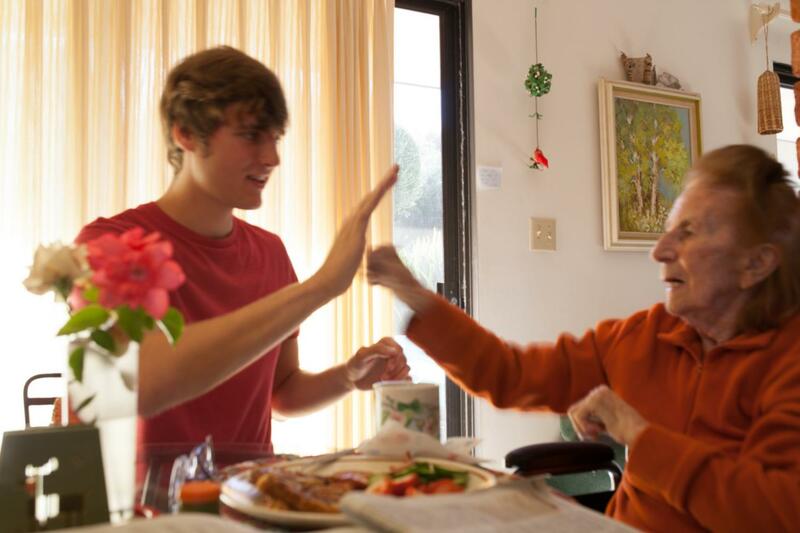 James believes that the elderly should have people they can connect with often. Therefore, he brought into the house Ria in the 90s. But because Ria was a tour guide and was often not around, and with himself being busy as well, he believed that Helene needed a more attentive and available companion. Helene waves at the camera as she hits in the glass-door doorway of her home in Palos Verdes Estates. Photo by Jack Kan.
One day Helene found herself in a hit-and-run accident. She was driving when she got hit. She fortunately didn’t suffer any injuries, but this ceased her driving days. Around the same time, Hunter was finishing up high school. He says he didn’t take his studies seriously and that he was the class clown. He thus let his grades drop. By the time graduation came around the corner, Hunter realized it was too late to turn things around. He had no idea what he wanted to do next; what direction he should take. With James’ encouragement, Bill Denton, Helene’s son who lives in Richmond, got in touch with Hunter and asked him to come out to California and take community college courses here while being the chauffeur to his mom. “In my wildest dreams, I never envisioned myself flying out to California,” Hunter says. “But all of a sudden, there’s this chance.” Out of the blue, the opportunity to come out to live in California, a “mystical place” as he says, appears and Hunter accepts it with no hesitation. Hunter recalls the view of “unbelievable sights of nothing” as he and his father drove across the country from Virginia to California. “I did not try in high school. I was a troublemaker. I liked to goof off and have fun. I did not care about my grades. And so I let my grades slide,” Hunter says. During his senior year, Hunter came to two realizations: one, that he enjoyed school; and two, he can speak in front of people. Hunter finds that in LA people live a faster pace of life than in Mechanicsville. Although he feels blessed to be here in California, nothing can compare to where he was raised. It’s a faster life here, but a life he has gotten used to quickly especially because of the people he has met. Especially the people who live in Helene’s estate. “I consider them my second family,” Hunter says. Hunter says that it’s very much like a TV show and that there’s always an anecdote to tell. Helene and Hunter enjoy a morning together. Helene has a hearty breakfast of toast, ham, strawberries and cumbers and reads the “Los Angeles Times” as she usually does at her kitchen table in her Palos Verdes Estates home. Photo by Jorge Villa. One “hilarious” account is the time Helene had began using her walker, Hunter recalls. Her son Don Denton who was visiting at the time had made some changes to the home to make it easier and safer for her to use it round the house. Helene didn’t like change and she wasn’t too happy when she saw her rug missing one day. Then the next, her bedroom doors went missing. Yet her son would not budge and put the doors back on when she made it clear to him that we wanted them back. “What, Ms. Denton,” Hunter fumbles over his words, uncertain if he should listen to her or uphold her son’s orders. “Now, help me get my doors back,” she demands. Both Ria and Hunter were bewildered. “If you don’t help me, I’ll bring them myself,” Helene says. “I think it’s that feistiness inside of her,” James says to Hunter. “If you don’t help me, I’ll bring them myself,” Helene says. Helene holding a framed picture of her and her late husband William J. Denton who served in WWII as a bomber pilot. Photo by Jorge Villa. This independence in Helene is something that Hunter strives to have. Taking the step to come out here and start going to school at El Camino has opened the doors to that. Back in Mechanicsville, it was hard for Hunter to be an individual he says. People back home know what a good person his father is. And they know his twin brother and what an ambitious football player he is. Hunter had this part of him that wanted to live up to their greatness; a battle that he was losing he says. A way out of this battle was what he needed. As much as Hunter is glad that he can now explore his individuality, he says that he wouldn’t be the man today if it wasn’t for his father and the rest of his family. “I’m blessed to say Rodney and Sandy Elam are my parents,” Hunter says. Yet he never knew “true responsibility” until he was acquainted with Helene Denton. Hunter became more than just a guy who was brought out to drive a lady around. He was there to be a companion and to be sensitive to the needs of a lady who had lived a long life. In return, she awakened something in him that his life would be over before he would know it. Helene and Hunter hold hands as she chatters away with him right outside the glass door of her estate’s kitchen in Palos Verdes Estates. Photo by Jack Kan.
Hunter says that he recalls when Helene once told him “it feels like I was your age just a blink of an eye ago” and how that has stuck in his mind. “I think I feel young, but before I know it I’ll be in her situation,” Hunter says. Although Helene is 95 years old, she is striving for her age. Clarita, the caregiver, came in full time just in the nick of time to help improve Helene and her health and to keep her active. Back here in California, Clarita sees Hunter as somewhat a son to her and Hunter sees her as a motherly figure. “She stays on me about school,” Hunter says. But Hunter looks up to Clarita in other ways, such as the selfless being she is and the life she brought out of Helene. Clarita has been Helene’s caregiver for over a year now and stumbled onto the opportunity by covering a shift for her friend. She met Helene on Helene’s 93rd birthday. It happened that her friend who was a part-time caregiver for Helene needed someone to cover her shift for three days, so Clarita offered herself. She took care of Helene for six hours for each two days, and 12 hours for the third day, and by then Helene’s son knew that he wanted to hire her. Clarita recalls the first time she ever felt the “heart warming” feeling of taking care of someone. When she was in the fifth grade, she went to visit her grandfather who was living alone because he was ill. She stayed there that day and cooked and fed him. She says that since then she knew this is what she enjoyed; taking care of people. It began when she was young in the Philippines. Clarita has helped Helene in ways that they could not imagine. 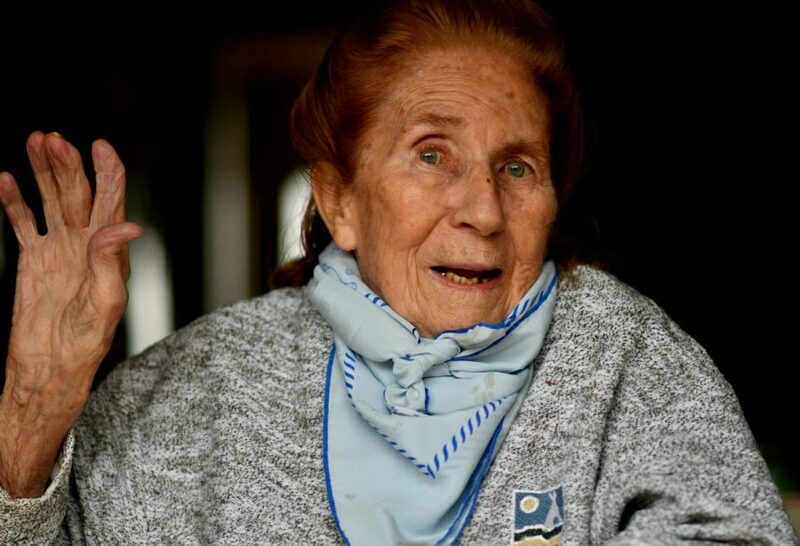 Before Clarita was introduced into the home, Helene went through a tough time where she began to fall ill and was taken to the hospital and then the rehabilitation center. At the rehabilitation center, no one had Helene walking and they simply confided her to her wheelchair with the mentality that this was her fate. When Helene was put into hospice. Her sons had her come home she was weak and didn’t walk at all and didn’t talk much. When Clarita came, she not only took care of Helene, but she knew that somewhere in Helene there was still more in her. So Clarita had Helene sing to help her speak. And she had Helene walk little by little everyday with a walker, until Helene had more strength. One of the exercises that she does with Helene to improve her speech that Hunter often participates in is singing. 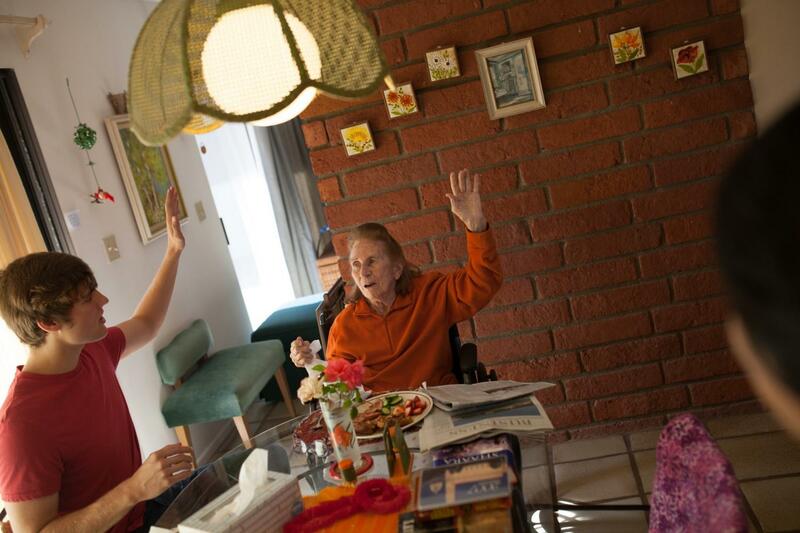 (Only shown partially in image on the far right,) Clarita is singing along with Hunter and Helene, a practice and bonding time enjoyable to the three at the kitchen table of Helene’s estate in Palos Verdes Estates. Photo by Jorge Villa. Back at the estate, the entire kitchen is filled with melodious vocals of “Que, Sera Sera,” by Doris Day. Clarita and Hunter sing as they encourage Helene to participate. Helene obliges and her little voice starts to sing along. From time to time, her voice carries and rises above the room. They sing another song where Clarita and Hunter say, “the little ducks go…” and Helene finishes the line with “Quack, quack! Quack, quack!” They also sing another song called “Father Emily” and “Pick up the Piece of Love”. Music seems to be a big part of the house. Clarita, who has a son around Hunter’s age is studying to be a nurse back in the Philippines who also sings as a hobby. A little after the singing session, Hunter starts to feel hungry and decides to go to Trader Joe’s. He goes for the sandwich wraps. He says that his routine is to go to school and Trader Joe’s and to drink a lot of coffee. He commutes back and forth to El Camino to PV. He doesn’t mind the 30-minute drive. He uses that time to listen to the radio and then argue with it to keep himself entertained. Hunter is a political science major and identifies as an independent although he would easily identify as a Republican as well. 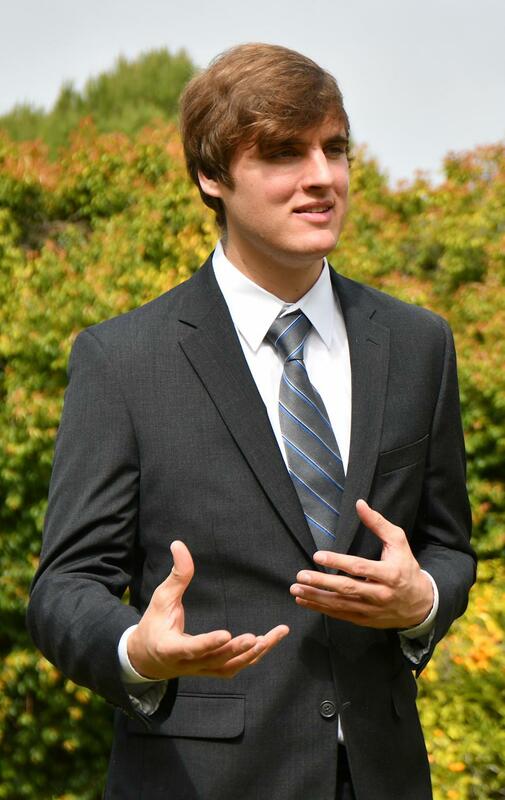 He spends much of his time in student government where he serves as senator of behavioral and social sciences as well as being a part of the debate team on campus. Both of these experiences Hunter says he is passionate about. Hunter would love to one day be president of the United States, but has not solidified any plans to get there. He is more interested in taking things day by day and really soaking up the moments in life. If there is anything that Hunter feels he has learned from Helene during his stay here is that she has taught him patience. And hours or so later he would say the same thing and she would respond in the same way. And this determined for Hunter that that moment at the kitchen table, when she had choked on her oatmeal on that initial meeting, that there was something to benefit Hunter in his life. Helene and Hunter in Palos Verdes Estates. Photo by Jack Kan. 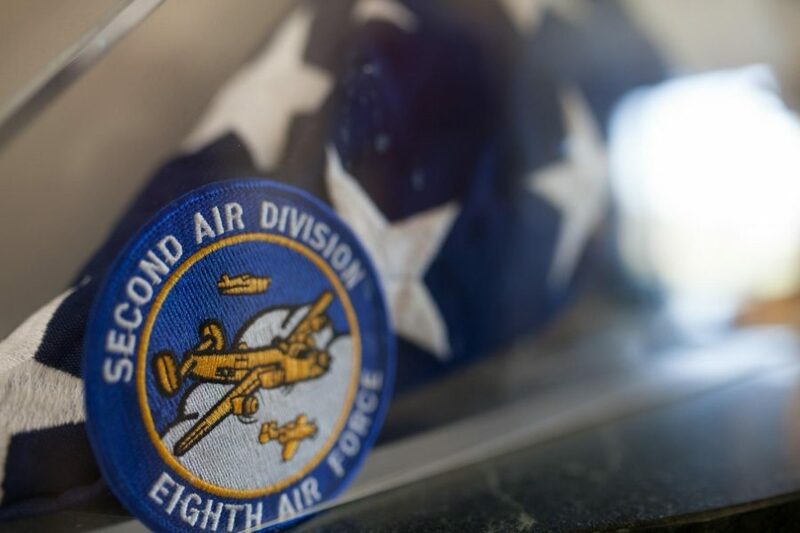 The United States flag that was folded in honor of William J. Denton’s funeral who served as a bomber pilot during WWII. It is now encased inside a glass case and sits on a table to the left as you enter Helene’s estate through the front chocolate bar-like doors. Photo by Jorge Villa. Hunter affectionately interacts with Helene. Photo by Jorge Villa. Helene throws her best jab at Hunter in Palos Verdes Estates. Photo by Jorge Villa. 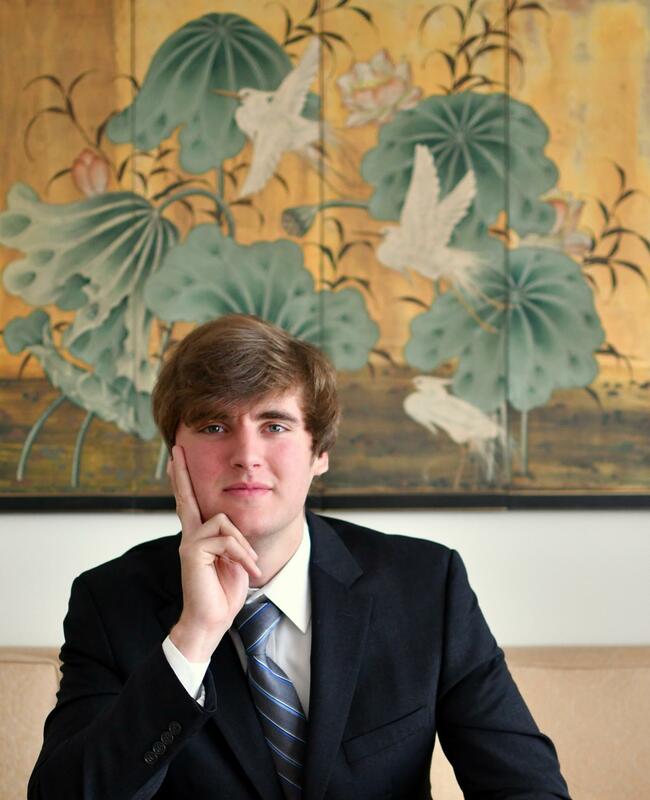 Hunter Elam in Palos Verdes Estates posing on the sofa in Helene’s Palos Verdes Estates living room. 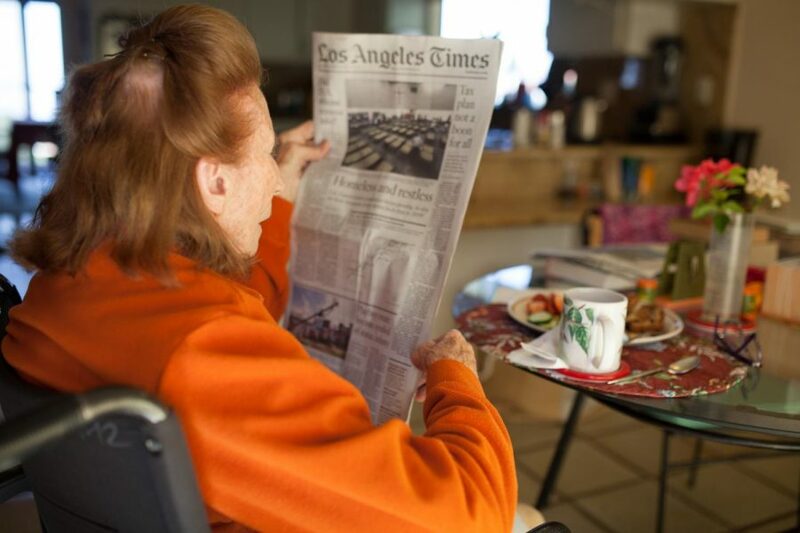 Photo by Jack Kan.
Helene reads the “Los Angeles Times” while she eats her breakfast at the kitchen table of her Palos Verdes Estates home. Photo by Jorge Villa. 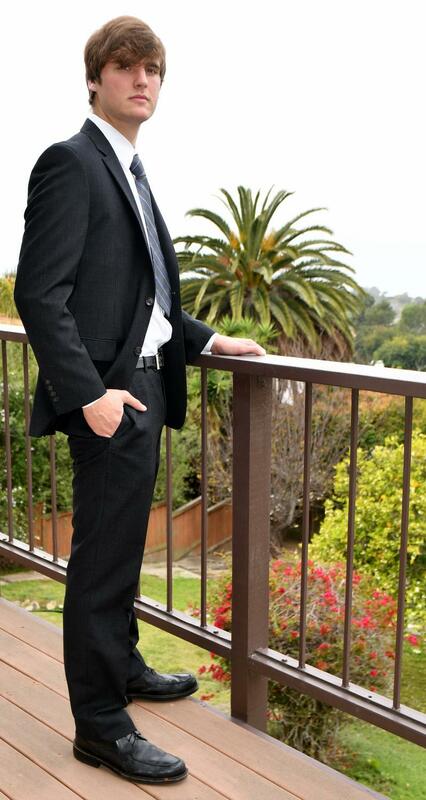 Hunter Elam shows his serious side on Helene’s estate’s balcony in Palos Verdes Estates. Photo by Jack Kan.
Helene chats away as Hunter intently listens and asks her questions in the kitchen of Helene’s home in Palos Verdes Estates. Photo by Jorge Villa.